Can an Asian team ever win the World Cup? Which players will help lead South Korea's bid for a world title after the retirement of Park Ji-Sung? As I watched Japan beat Qatar in an exciting quarterfinal at the Asian Cup, I wondered if a team from this confederation could ever win the World Cup. My first thought was “definitely not,” but considering the 2022 tournament is taking place in the region, will AFC nations have more motivation to improve their infrastructure and coaching in order to shine in 11 years' time? As you probably know, only one Asian nation has ever made the semifinals of soccer's top international event, South Korea in 2002. Now, as well as the Red Devils played, they had the advantage of home support and benefited from some fortuitous refereeing decisions in the matches against Spain and Italy. Even so, their achievement made many pundits believe a bridgehead had been established for the region’s football teams to mount regular assaults on the latter stages of FIFA’s flagship event. A hope that has sadly remained unfulfilled. In 2006, only Australia made it past the group phase before losing to Italy, while last year Japan and South Korea were dispatched in the round of 16 in South Africa. In order to analyze the possibility of an Asian World Cup champion, we have to look at the pros and cons of teams from the region. This is incredibly difficult to do considering the cultural and social differences between many of the nations, but it would be fair to say they all share one problem: lack of experience at the top level. If I asked you to name the top-five Asian players of all time, how quickly could you answer the question? Not easy, is it? The fact remains that few have made an impact on world football's best domestic divisions, where quality opposition and high standards of technique are a week-in, week-out reality. A presence in the top leagues of Europe is required. I would pick out Park Ji Sung, Hidetoshi Nakata, Ali Daei, Mark Viduka and Cha Bum-Kun for their achievements for club and country, but none of them have set the world alight. Another challenge, historically, has been the style of football. Detractors have labeled Asian teams as soft; as sides that shy away from physical clashes and mid-air tussles. Whether this holds water or not, the record shows that Asian teams have rarely done well against nations with strong center-backs and strikers. In my opinion, the priority for the top Asian teams right now should be to invest in coaching. The federations in Australia, Japan, South Korea, Iran and Saudi Arabia should try to sign top coaches from Europe and South America to work with their youth teams. We have seen what Guus Hiddink managed to do in 2002, and look at what Alberto Zaccheroni is accomplishing with Japan right now at the senior level. If coaches with international experience could influence young, talented Asian players, a football revolution could take place in the region leading up to the 2022 World Cup. Right now...it is very, very improbable that an Asian team wins a World Cup. Watching the level of play Spain showed in South Africa and considering the "usuals" Brazil, Argentina, Italy, Germany...I find it very difficult for an Asian team to win it. At least I don't believe it will happen, perhaps in my lifetime...but who knows...the world changes, times change. If European and South American teams aren't participating they might have a chance. Same question to the United States? They are so good in all other sports except Soccer. Didn't they say the same 10-12 years ago about an African team winning the World Cup? Yet they haven't even made a semi-final, let alone winning it!! I would put my house on it an Asian team won't win it before 2030.
i think it's impossible. but the level of asian football is increasing. Tsubasa Ozora is the Top-Asian player of all time. Personally I doubt it. Not because Asians are less talented BUT because soccer as a sport is not as ingrained in the mind of its youths as say in countries like South America or Europe. These countries also have professional leagues and highly organized football clubs or leagues basically from kindergarden up to college level etc... and very well organized and experienced professional soccer clubs all over not to mention $$$$ etc. Until countries in Asia have this sort of infrastructure in place, it is highly unlikely asian countries will win the world cup. 2004, can greece win the world cup? No one expected it, but they did! Asia is rising, in 20 years look what china achieved. from a poor country to the 2nd richest. I think there isn't any chance for Asian teams to win the World Cup. Even some teams dominate countries like the United States. For example, Germany has a team which is at the beginning of its developing. Probably the will be in three to four year the world's best team. They're young, qualified and well skilled. Asian won't pass this high levels of developing. So in my mind, Europa is still the best place were proffesional soccer players are able to grow up. Qatar in the quaterfinals? I doubt that strongly. Money and football rarely go together You need to have a strong football culture in a country first of all/ Qatar does not have that. Second, you state that Japan and Aussie do not have top players in top flight leagues: where are Qatar's? Petrodollars won't win a World Cup. Not until the local leagues become competitive. Remeber that strong local leagues are the ones who provide talented players. If you haven't got that base, you'll never succeed. Basic. It´s Sport, every Team can win the world cup! A good example is uruguay, a little country and they were at the 4. place. I think with luck can some little countrys win the world cup too. But i hope germany wins the next world cup, they had played the best football in the wm! I cannot imagine how CNN can published such an article in their blog. If the writer talk about Asia and he just mentioned Saudi Arabia in the end , that means he/she does not know anything about the soccer in Asia. it is better for him/her to wonder if the US can win the World Cup! Saudi Arabia , Japan , and Iran are the only nations that won the Asian Nations Cup for 3 times , however; Saudi Arabia also was Runners-Up for other 3 times. Saudi Arabia has won the World Cup for under-17 and if you can win the under-17 you can win the real World Cup. I too can't help but wonder if an Asian team will ever win the World Cup. However, I don't believe in saying never. Anything is possible ... when they are determined. About the Koreans reaching the semi-finals in 2002 ... The games against Italy and Spain did have some very bad calls against not only the Italian and Spanish sides, but also against the Koreans. It seems to me that it was fairly unfair, but the Koreans still seem to be the better team! They were more determined. If any Asian team wins the World Cup, I hope it's the Koreans. Hi Pedro. Though I'm not very familiar with football, as a Japanese, I think Japan football has a kind of conflict. We want many countrymen to play in European top league ,at the same time we have to make our domestic football club league stronger. Only about 20 years have passed since J-league was inaugurated, in last two decades J-league has progressed greatly thanks to many great overseas footballers who have come to Japan, played at and/or coached J-league club. Zico, Leonard, Littbarski, Buchbald, Wenger, Stojković(now coaching Nagoya) and many others, they had made great contribution for Japanese football to progress, inspired crowd, now football is most popular sport in our country along with baseball. We're still far inferior to European and South American. Partly we have no choice for that because of much less heritage than that of Europe or South America ,but we have a lot of room for growing up, bridging the gap with the world. As you say Japan and J-league must invest many overseas experienced genius as well as many young players go to Europe. More prosperous J-league may get more attention from overseas which could bring more chances for Japanese footballer to play in Europe , eventually that will make national team stronger. One big problem is massive recession of Japan economy in last two decade, which makes radical investment difficult for clubs and federation. Actually economy is now hugely affecting not only football but also overall Japanese sport field. "Same question to the United States? They are so good in all other sports except Soccer." Only sports that USA is good in are the sports that are not played anywhere else. Americans are not good in team sports, they don't play football/soccer well they don't play rugby, they don't play cricket. Well is south Korea or Japan put there focus on and prepare well and get their minds set anything (shun politeness) is possible. k1ds0n USA is not so good at many sports, hockey (authentic on grass), cycling, horseriding, cricket. etcetc. Any sport there are good at was adapted to USA culture. Otherwise there is no interest. Considering most of the Asian teams are years behind in football compared to the European and South American teams, due to wars and internal conflicts. I believe within the next 20 to 30 years we will see changes in Asian football as more and more generations putting the time ,resource and effort into this beautiful game. I am a Korean citizen but its a 60% chance we are not gonna win because our players cannot PASS THE BALL!!! It is possible. Let Mourinho be the coach. I have to take issue with your comment "none of them have set the world alight". How has Park Ji Sung not set the word alight? He has been Man Utd player of the month 2 months straight, has played in a World Cup Semi Final, Champions League final... the so called 'big name players' in England can hardly boast these accolades. The media is full of racial stereotyping like "Asians don't fancy it against big center halves" which stop them getting recognition they deserve! Cha Bum gun was roasting 'big center halves' in Germany in the 70s/80s and South Korea made a mockery of the "big Greek center halves" at the World cup. Whats the difference between these cliches and the now unacceptable and arguably racist cliches that African teams are tactically naive? @MellO. What you said a thousant times... Also according to what Pedro said about putting loys of money into soccer in Qatar, does anyone really money is the issue? At least in my country real talent is found on the streets, so I don't think money will make a country that doesn't have any tradition in soccer to be a quarter finalist in 2022 passion is what makes the game, not money. LMAO. Whatever. Sounds familiar when people thought, especially Pele, that an African team would win the world cup. And this was said back in 1990. Still waiting. I'm a huge of the Korean National Football/soccer team(I'm Korean), but even I don't think that an Asian team will win the World Cup any time in the near future. Frankly, there's a large disparity between the Eastern and Western hemispheres. Aside from the abundance of talent, the Western nations simply have better leagues and systems that facilitate a higher level of playing. I envy Brazilian fans, Spansh fans,etc that watch the World Cup hoping that their country's team will win. Koreans are always just hoping to get past the group matches or into the quarter finals. Oil rich nations are already pumping lots of money into the sport. I hear Qatar national soccer players are getting paid something like around 40,000 – 45,000 US dollars per game. Japanese national soccer players get 3000 USD PER WIN(if they lose they don't get paid the 3000 dollars). Last year some Japanese national soccer players threatened to boycott the national soccer team because of the pay. When you look at what the middle eastern players are getting paid it's no wonder the Japanese players felt unsatisfied over their pay. Sorry to disappoint you Pedro, but Park Ji-Sung announced that he was retiring from the national team after this Asian Cup. They are one of the few countries in Asia that even enjoy soccer and play the game. If an country from Asia is going to win it's going to be from one of these three countries but it won't be for a long time before they get the trophy. The only asian teams that seem to have done anything at WC in past are Japan, Korea, and Australia. Saudi are probably one of the worst performers on WC stage. Top goal scorers at WC's in past usually come from a group that includes Saudi. Asian football lacks the polish and finishing of the South Americans and Euros. Japan, Korea and Australia are the best of this sad lot. Qatar will need to pump alot of money and effort into their team between now and 2022 just to keep from getting embarrased. If they manage one draw in the group stage, that should be considered a victory. If they cannot win the Asian Cup on home soil, there is NO WAY they stand a chance in the WC. "Could South Korea's Park Ji-Sung lead his side to Asia's first World Cup title?" 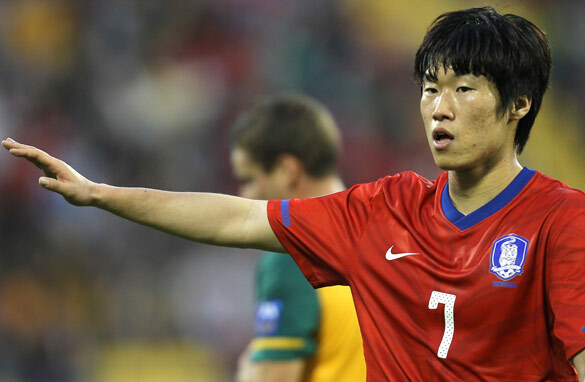 As mentioned, Park Ji-sung announced this was his last international appearance. Then again, I wouldn't be shocked if he captained the 2014 South Korean squad. Definitely can. If anyone, Korea or Japan. Look at where they were in the 90s (beaten 0-5 by Europeans/South Americans).. now (matching if not occasionaly beating them)... I say it could happen in the next 2 decades! One element that has not been addressed is referees. Though we all wish it weren't so, poor refs at a single game can push back decades of progress. Above you've mentioned the Spain and Italty games in 'o2, but there was also the Swiss game in '06. Even in the Asian Cup, I think I saw just one Korean ref. Things aren't actually better in Korea itself – there's sometimes news of refs taking money. I guess its a plague in all regions, but for one reason or another, it appears there's a dearth of Asian refs in international play, and this needs to be addressed. Pronto. >It is possible. Let Mourinho be the coach. Trust me, Japan will be in the top 4 at the world cup in 10 years. Leading by Kagawa, Matsui and Honda, there will be this 3 teens, Miyaichi(Arsenal), Ienaga(Mallorca) and Usami ( Gamba Osaka) will be extatic and very very hopeful. Hello~ I'm a Korean guy who loves soccer very much. In Korea national team, Park, in Manchester Utd, Ki and Cha in Celtic, Scotland ,Son Heung Min in Germany league. and I know that many other important players of other Asian players, such as Honda, are learning great skills of big leagues. Which means, Asian teams are changing.Combination of skills from 'soccer developed countries' and 'NEVER GIVE UP' spirits that Asian teams have will make big difference near future. I hope that one day an Asian team (personally Korea Rep ^^) became the champion on World cup. ~!! Japan, South Korea, China and even India could be contenders for lifting the World Cup in the not so distant future. Interest for football is fast growing in Asia. Players will come from the huge populations of India, China and so on. I'm a big fan of Ji-sung Park. Today he officially mentioned his retirement of national team. He was really great football player of Asia. Asia has a lot of outstanding young player. Chung-young Lee, Koo, Honda, etc. Someday Asian football team must be strong. i'd say Shunsuke Nakamura made waves as well. don't worry, the time will come for Asian football to dominate. In short an Asian team will never win the world cup in my lifetime but the world is so strange now that anything can happen. Realistically there are only three Asian teams good enough to reach the second round or at world cuip level- Australia, Japan and Korea Republic. But there is no way either of them (Australia being the best chance) of knocking off the likes of Germany, Italy (although Australia should have done so at 2006 round of 16), Spain, France, Brazil, Argentina, England and the Netherlands. Actually apart from these teams only Portugal, USA and Mexico are capable enough of winning the world cup one day but not in the near future. An Asian or African team will never win the world cup considering that Europe is where the game is at and almost surely will stay. Europe and South America are substantially stronger that these confederations overall. Even traditionally stroing teams may not win the world cup let alone an Asian team. winning a world Cup is not a hard task for an Asian team....South Korea reached the semis in 2002 edition..they could have done it..i believe one of Japan ,Korea or Australia will win..all they need is a good plan strategy, a strong defense ,one or two goal poachers ...and they will be World champions..the Italians did it in 2006,Greece in 2004 Euros and the USA were in the final of the Confederation championships a couple of years ago right so i see an Asian team winning come 2022 if they can stand the heat......i will put my money on the socceroos. You have got to be joking my friend... i heard one ninny on here declare that japan had reached a quarter final. In fact they never have, only a 2nd round appearance in a tournament they co hosted in 02. Korea were in a semi, but only after controversial ref decisions. Did any of you guys happen to catch the latest confed cup? The one where japan were despatched in every match? Im sorry to inform you guys but asian teams are so far behind that it is literally beyond the horizon to contemplate an asian team legitimately could win (lol) a world cup. Only teams with long established football cultures have done so (uraguay, brazil, argentina, germany, italy etc). But not only this, its the high level of play and physicality that asians teams will never match. Unless they bring their domestic leagues in line with the top leagues in europe or south america, it will never happen. To say that india or australia (the latter who will have their golden generation all gone by 2022) will win is nothing short of ludicrous. India have never and will NEVER produce a pele or a lionel messi. Even african sides who regularly produce far better players than japan or korea have ever done in their entire histories (think eto, drogba, milla, okacha, yaya toure) havent yet appeared in a semi final. Wake up people! for now , it will be a no. but someday they will. Korean soccer players have " blind spot" its biggest weakpoint. Europeans, Latin Americans are very good attacking " Asian Blind Spots". As for now only South Korea made final four 2002 World Cup. Its the highest in Asia. South Korea or Korea has showed very poor showing in Asian Cup.